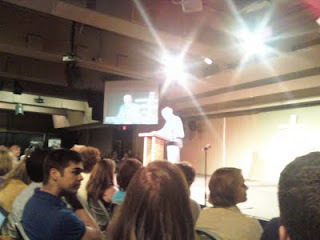 Well, as if the morning session wasn't great enough, the evening session of Stanley Hauerwas' lectures at APU was outstanding. There was a larger crowd and a better venue (APU's UTCC) and Stanley's topic was on "America's God." He talked a bit about the differences between what America believes and what the Church believes. Although it is impossible to speak like this without some level of generalizing and even stereotyping, Stanley was talking in broad terms of what ideas have been pervasive in Americanism verses what is inherent within Christianity. Some differences include America's fear of death (specifically over against its fear of God) verses the Church's belief in Christ's victory over death, its definition of freedom verses the church's, differences in memory of history, and America's belief that "you should have no story other than the story you chose when you had no story" verses the Church's belief that we are grafted into a story we did not choose through the death and resurrection of Jesus Christ. Some of these foundational differences almost automatically place our identity as Christians, if our Christianity is to be coherent at all, in tension or even at odds with our identity as Americans. One important task that the protestant church in America has too often failed in is the task of making it clear and distinct what our "we"s mean and when our "we" is not America's "we."